May 21st thru May31st marked the very first Restaurant Week in Lisbon, with some of the city’s most popular fine-dining restaurants offering 3-course lunches and dinners both at a special price of €20. Restaurant Week was organized by TRYP Portugal and sponsored by Sabor do Ano. Being a huge fan of Restaurant Week back in the States, it was without a doubt, I planned to attend. However, as half of the participating restaurants were already sold out by the time my fellow Lisbon Twitterer and Twinelis fan @jnogueira and I learned about Restaurant Week, there was a bit of a challenge to get a reservation at the last minute. But we were finally able to book an early lunch with Restaurant Conventual, one of our 3 picks from the remaining available restaurants. We chose Conventual because of its rich history. 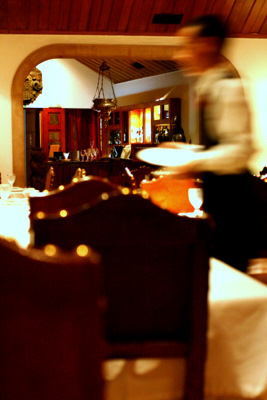 Renowned as one of the most famous fine-dining restaurants in Lisbon, it serves traditional Portuguese cuisine, taking mainly from the classic flavors of Alentejo. Upon its opening in 1980, it became the most popular restaurant to dine among government officials who often brought their foreign visitors to showcase Portuguese cuisine. Recently, the restaurant has received mixed reviews, while generally leaning on the positive side. Situated in the lovely Praça das Flores, a cozy, shaded plaza at the bottom of residential neighborhood of Principe Real, Conventual is surrounded by several quaint gourmet restaurants, cafes and vintage shops selling classic Portuguese memorabilia. But if you’re not careful, you just might walk past Conventual, as its modest and inconspicuous windowless entrance with a tiny little brass name plaque blends effortlessly into the scenery. Once inside, I was astounded at what lay beyond their antique wooden door. The restaurant consisted of an elegant cavern with brick archways and walls decorated with antique Baroque tapestries and wood carvings. The manager checked our reservation in their old handwritten clipboard and asked if we would like to start with a drink in the lobby while they finished setting the table.Â We accepted and each ordered a glass of sparkling water, still recovering from intense heat of the day. The service was prompt and professional, go so far as to apologize when they brought me a lime and lemon when requested the second time. When guided to our table, we were greeted by a basket fresh bread, marinated olives and what seemed to be a slice each of gingerbread, very reminiscent of my mother’s recipe which was a nice touch, but admittedly a bit peculiar. We each ordered one of the two options in the 3 course Restaurant Week menu, while perusing their wine menu.Â The wine list was was simple, with 5 whites, 5 reds and 3 sparkling wines. The majority of their reds were offered in half bottle selections, and the rosé was only available off the menu and consisted of a basic house wine. 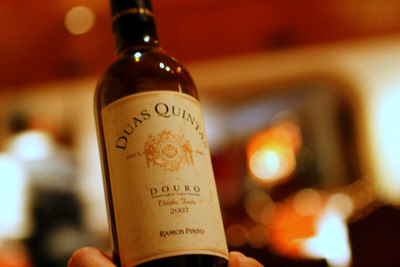 We selected a half bottle of the 2007 Duas Quintas by the famous Ramos Pinto from the Douro. Made from Touriga Nacional, Touriga Francesa and Tinto Roriz (Tempranillo), this young wine showed expressive and lingering notes of ripe red cherry, currant and blackberry. As for our meal, we started with the Salada Frei Hortelão, which was essentially a hyped up mixed green salad with balsamic dressing. The salad was fine, but nothing to write home about. On the other hand, the Créme de Coentros (Cream of Cilantro soup), consisting of a potato and cream base with a pungent cilantro aroma and silky herbal flavor, was absolutely delicious. For our entrees, I had the Pato com Champagne e Pimenta Rosa (Duck with Champagne and Rose Peppercorns), a braised duck thigh covered in a creamy light brown sauce dotted with whole peppercorns and accompanied by a Middle Eastern style rice pilaf with dried raisins. The presentation was a bit messy, and biting into a whole peppercorn wasn’t exactly “pleasant”, but I thought the dish overall was quite flavorful. João’s entree, the Bacalhau Espiritual (“Spiritual Salt Cod”) was not very spiritual looking as a big mound of creamy potato gratin style codfish casserole, alongside a basic mixed green salad. Although I enjoyed the flavor of the dish, João remarked that it was very typical and had been prepared better in smaller quaint restaurants. For dessert, I ordered the Migas Doces. 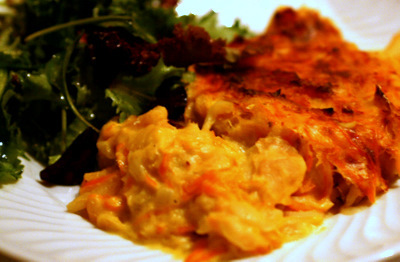 Migas is very similar to the popular Alentejo savory bread-pudding, but served sweet. While João had the Encharcada, a bread soaked in egg and sugar and baked. Both desserts were quite indecipherable in appearance, served in small mounds, sans garnish, as if they had just scooped a heap out of a larger dish. Overall, our dining experience at Conventual was a bit of a “ho-hum”. Despite the professional and attentive service, and tasty cuisine, the presentation was very lackluster and the recipes boring and unoriginal. My impression of this 80’s iconic restaurant is that its concept is still stuck in the 80’s. It was hard to tell if they were grouped in with those type of restaurant participants we all have seen who don’t really put that much thought into their Restaurant Week menu, or if that is there normal day to day service.Â Be that as it may, I would love to see Conventual get a little facelift, such as keeping their traditional style but modernizing their presentation, expand their wine list in both quantity and selection and dress up their inconspicuous entryway to make it more inviting to those passing by. If our experience is any reflection to the other meager 22 participants than Lisbon’s first Restaurant Week is off to a rocky start. However, one strategy they have intelligently followed suit from other Restaurant Week pioneers is that they extended the special for a second week, allowing me to share, yet another restaurant experience with you. I won’t share any juicy reviews as of yet, but I will say that it will be worth a read.